Maghi Purnima is celebrated in the Hindu calendar month, Maagha. As per the Gregorian calendar, it corresponds with January/February. Thousands of devotees gathered in Allahabad's Sangam, the confluence of River Ganga, Yamuna and mythological Saraswati for Ganga-aarti on the occasion of Maghi Purnima today. The devotees were part of the Magh Mela festival, one of the world's biggest religious festivals involving ritual bathing in the holy waters of river Ganga. Apart from bathing in Ganga, the devotees also perform prayers, Pooja, mahayagya and charity. It is believed that holy dip in Ganga water will help in alleviating a person's sorrows. 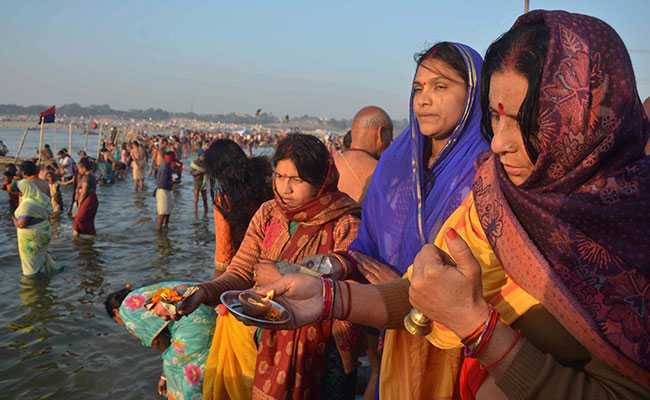 The 45-day mela is currently underway, with pilgrims camping across Allahabad and joining the colorful throngs for dips in the venerated waters. Maghi Purnima is celebrated in the Hindu calendar month, Maagha. As per the Gregorian calendar, it corresponds with January/February. Devotees take the holy dip in Ganga before the sun rise and also chant 'Surya Mantra'. After this, water is offered to the sun. Devotees keep fast for the rest of the day as it is considered rewarding and also offer food to the poor. Donations in the form of clothes, food, cereals, ghee, jaggery and fruits is considered to be rewarding. In some regions ancestor rituals are also held on Magha Purnima for peace of the departed souls. This time a total lunar eclipse, colliding with super moon and blue moon, referred as "Super Blue Blood Moon" by NASA, is also colliding with Maghi Purnima. In the Hindu legends Purnima is known to be an important day for performing religious and spiritual rituals, and of these, the Magha Purnima is one of the most auspicious.